Gary Moller and his family are now enjoying the benefits of an advanced vacuum tube technology solar hot water heating system. Supplied and installed by New Zealand Solar Heating, the installation was carried out recently at Gary Moller’s Wellington home, and combines the best technology Europe has to offer with the highest level of expertise available to New Zealand households and commercial clients. Most homeowners familiar with solar water heating issues will be well aware that Gary Moller and his family have had some bitter experiences with their previous solar water heating system, experiences replicated all over the country by operators taking short cuts and compromising the operational efficiency of the product supplied to homeowners. Gary has heard many complaints from disgruntled consumers across the country and has seen many types of solar water heating systems with major problems. The panels of their previous solar water heating system which had been installed on an ‘open loop design’, were replaced three times in four years, and are now most likely in a landfill somewhere. For those not familiar with the terminology, an ‘open loop design’ is when the contents of the hot water system are circulated through the solar collectors to exchange heat. As can be seen from the picture below, the major draw back to this method is that a rapid build up of minerals can occur on the inside of the pipework to and from the collector, as well as inside the collector pipework. Mineral buildup diminishes the performance of the collector over the long term, starting gradually until it reaches a point where the performance of the collector is seriously impacted. The following images illustrate the effects of mineral buildup. Interestingly, ‘open loop systems’ have virtually been consigned to the solar heating scrap heap in most parts of the world. The design of our advanced vacuum tube solar hot water heating systems is very different from the previous Moller installation. 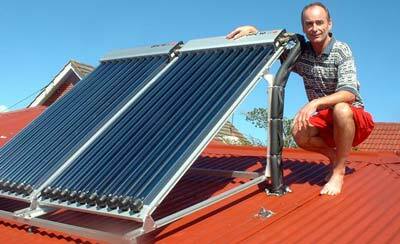 GoSolar New Zealand only installs its advanced vacuum tube solar hot water heating systems on closed circuits. We utilise a heat transfer fluid through the collectors, solar pumping station and through an internal coil, in a specially designed solar tank that exchanges heat from the collectors to the storage tank. This ensures that there is no degradation of system performance over a period of years. Another unique feature of the advanced vacuum tube solar water heating system is the level of quality control in the manufacturing process. Every collector that leaves the AMK-SOLAC European factory is subject to the renowned rigorous Swiss quality control regime. With the old tank from the Moller house consigned to the landfill, a new solar closed loop tank was installed in its place. Adjacent to the tank we fitted our dual string pumping station, encased in insulating rigid Poly that combines a flow setting device to ensure correct flow rates through the collector. It also features a safety valve (no TPR to leak on the roof’s of our customers), an air separation bottle to ensure air free operation and pump longevity (again no automatic air vents on the roofs of our customers), the solar pump, check valves, expansion tank connection, gauges and filling loop connections. 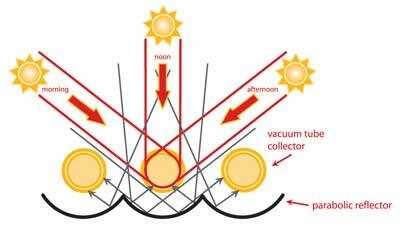 These features are critical to the long-term safe and reliable operation of a ‘closed loop’ solar system. 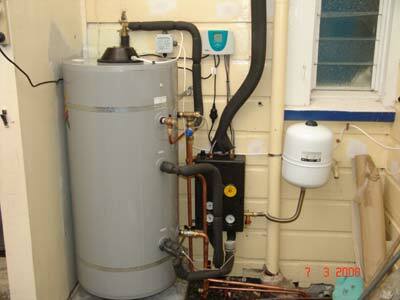 Do you recognise any of them from other solar water heating systems you have seen? Our Collector unit comes pre-assembled, ensuring a long operational life with no leaks. Added to these features are threaded connections that allow us to interconnect the pumping station to the solar panels with flexible stainless steel helical flow and return pipework. This is pre-insulated with UV resistant material and with roof sensor cable built in. Specially designed fittings at each end of the pipework screw on to the threaded connections at the pump station and at the collector. Leaks are eliminated by the ultra high temperature seals between them. We fitted two of AMK's advanced vacuum tube solar hot water heating OPC10 panels to the roof with engineered mounting frames. The smart design of this collector allows it to be mounted at any angle, from vertical to dead flat, and still operate effectively! However the collectors were pitched up at Gary Moller’s request to maximize the solar gain. NOTE: The mounting systems do not have the collectors in contact with the roof surface, preventing any potential corrosion reactions from taking place. With the unique design of the OPC10 panels, connection is only required on one side, with flow directed to the far end of the collector using smart hydraulic design. This allows for serial flow and results in low energy losses as the heat medium is transferred around the collectors. Between the collectors, flexible stainless steel fitments are used to ensure no leaks, particularly when the building moves under extremes of nature. Between the pumping station and the tank coil connections we fitted an energy monitoring device to allow system performance to be monitored over the long term. Further sensors monitor the temperature in the bottom of the tank, the return line to the solar collectors, the collector temperature and the top-of-tank temperature. An advanced solar controller allows smart control of the solar system and provides a high level of user interface and adaptability. The controller monitors the energy performance of the system, has a speed control to determine how fast the solar pump rotates, virtually eliminating regular stopping and starting of the solar pump. With the ability to control the electrical back-up to the tank, the advanced collector protection functions to prevent overheating and also has the ability to carry out many other functions as required. The following image illustrates the overall high quality of Gary Moller’s commissioned and operational system. Gary Moller and his family are now enjoying free energy from the advanced vacuum tube solar hot water heating system designed and installed by New Zealand Solar Heating, and will do so for many years to come. The system has ticked all the boxes for them; high quality, reliable, highly efficient irrespective of outside ambient temperatures, safe and with proven methods of monitoring the performance of the system. 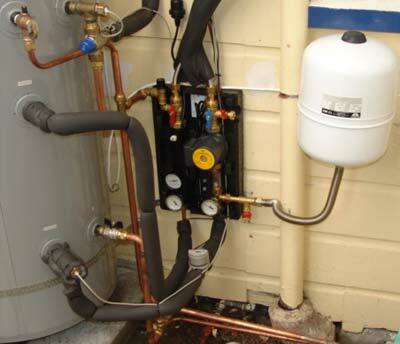 Our firm belief is that the current focus in the New Zealand solar water heating industry of supplying systems with fast payback at the expense of all else, is a case of flawed thinking. The important test of a system is whether it will last for 20-30 years and continue to provide a positive Return on Investment long after the payback period has passed. Statistics can be misleading and who knows how expensive energy will be in the future. As we enter a challenging time of peak oil and escalating energy costs, one certainty is that a Government with a vested interest in the Energy sector prices will not be working to bring down energy prices any time soon. As an example, during the first months of 2008, wholesale gas prices increased around 20-30%. The important factor is not what your energy costs are now, but rather safeguarding your home and family against the inevitable price hikes in the future. 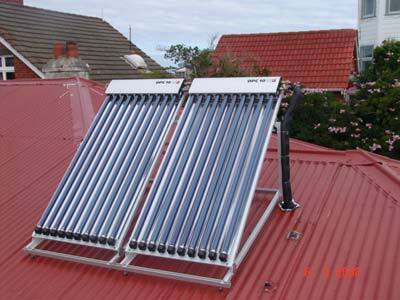 The question is why wouldn’t you install one of our advanced vacuum tube solar hot water heating systems on your house. ?